The best video game sequels don’t just make things bigger, they take what has gone before and build on it; they leave intact what was good and add enough to ensure that it’s not just a re-tread. The hardest thing is to do this with a game that already felt as complete as Drinkbox Studios’ Guacamelee!. As Mexican as a sombrero dipped in tequila and left to dry on an agave, Guacamelee! told the story of Juan, a former Luchador (wrestler) turned farmer, whose meaningless existence comprised almost exclusively of pining over Lupita, El Presidenté’s daughter. Murdered by the evil Carlos Calaca, whose deal with the devil seemed sure to spell destruction for the world of the living, Juan received a magical Luchador mask that returned him to life and imbued him with incredible powers. Aided by Tostada, the acid-tongued Guardian of the Mask, and the weird old goat wizard Uay Chivo, Juan set out to rescue his love and save the world. 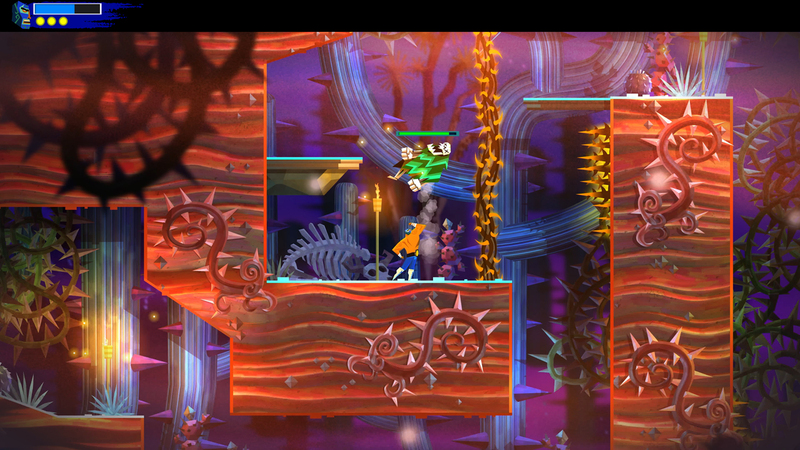 Now, while Juan succeeded in defeating Calaca and putting an end to his evil, it is revealed early on in Guacamelee! 2 that this only happened in one dimension of the multi-dimensional “Mexiverse”. In another universe, after Juan’s defeat, a Luchador called Salvador defeated Calaca himself but used the power he won for evil. Now he searches for a trio of ancient relics that will give him dominion over the entire Mexiverse. Of course, only one has the power to stop him, but he just happens to be an overweight ex-hero who has spent the last seven years raising kids and dreaming of his former glory. It is this plight that catapults Juan back into the heart of the action, as he once more dons the sacred mask and embarks on a quest that will take him across space, time and reality. Immediately, Drinkbox maximise on the premise, giving us glimpses of worlds based on various franchises such as Limbo, as Juan and Uay Chivo seek out the “Darkest Timeline”. Sadly, even though the mask removes Juan’s love handles and flabby moobs, it doesn’t return his former powers, and you’ll have to unlock them all again (as well as a host of new ones). The Metroidvania set-up works wonderfully here, as you steadily develop new traversal abilities that allow you to backtrack through the game and reach previously locked areas. As in the first game, the majority of Juan’s powers are colour-coded with the blocks that impede progress. For example, the Rooster Uppercut is red and allows Juan to smash red blocks above him, while the Dash Punch is blue and breaks blocks on the horizontal plane (as does the yellow-coloured bull charge). In addition to a wall-cling, a double-jump and the ability to phase between dimensions is Juan’s Eagle Boost, which allows him to attach to jump points and slingshot himself in any direction. 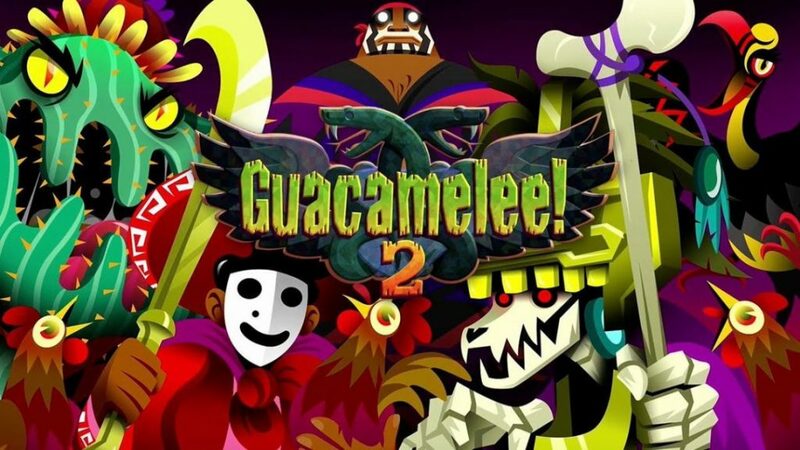 When chained with the other moves, traversing Guacamelee! 2’s deadly levels becomes something of a gaudy ballet. It’s tricky to master, but the fast pacing and often immediate danger mean you’ll occasionally fluke a series of moves and feel like an absolute god as you collect yourself on the other side. 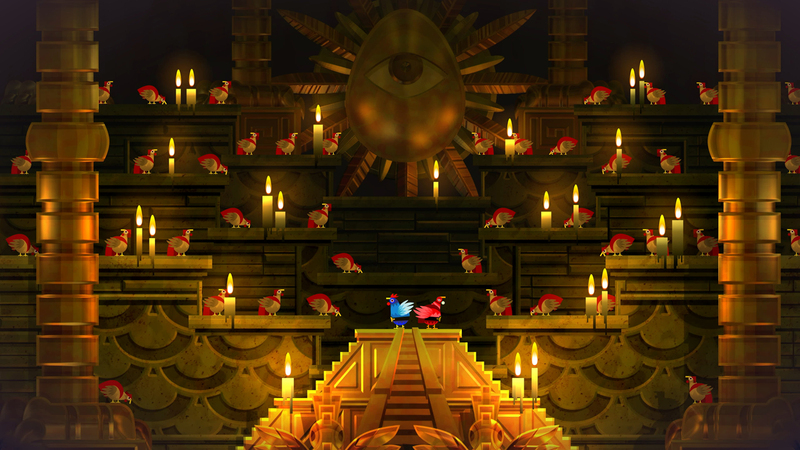 This being Guacamelee!, chickens play a bewilderingly large part. Whereas the first game allowed you to transform into a chicken to navigate small tunnels, the sequel goes full-pollo, weaving in a subplot involving an ancient society of chickens with their own designs on the relics. 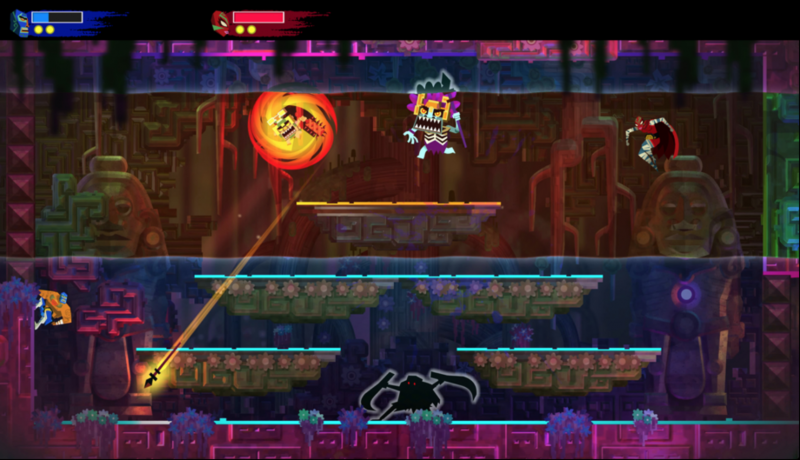 It’s mental, of course, but fits seamlessly into Guacamelee’s bonkers universe. Playing as el pollo is also greatly improved, as you can now use combos, dodge roll and wall-cling, and the new purple blocks can only be broken by a high-speed diagonal dive. New wrestling moves, passive skills, and stat increases can now be purchased from one of five trainers with gold you find in barrels and piñatas, giving you even more ways to dish out and avoid damage. The beauty of Guacamelee! 2 is how smoothly all these moves are integrated into the game. 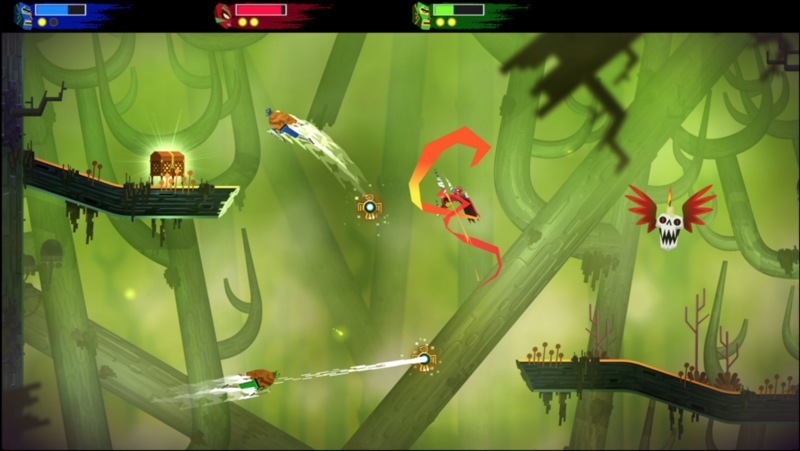 Colour-coded enemies require different abilities to defeat, while the level design is impeccable. You can tell this has been play-tested to death, not least because, if anything, it’s a little easier than the first game. The instant respawns and generous checkpointing alleviate a lot of frustration, while only the challenge rooms hiding health and stamina upgrades are truly teeth-shatteringly hard. Many areas are victim to “dimension waves”, which are essentially large moving funnels that cross the screen in various directions and alter what they touch. For example, in one area the dimension wave moves from right to left. As it passes over ledges they disappear, while the area below them becomes a river of lava. If you stay inside the wave, you’re safe, but you’ll have to avoid traps, obstacles, projectiles and enemies as you go. Speaking of which, almost all the enemies from the first game return, along with a huge cast of new ones including tribal-looking piñata dudes who spawn dozens of little versions when you defeat them, giant skeletons with clubs for hands, spear-throwing fetishes and shamans, who have the ability to continuously spawn new enemies into a level. Should you desire it, you can head into the game in drop-in, drop-out co-op with up to four friends – though you can only do this locally for now. Throwing three other characters (all with selectable skins) into the mix can be quite a mesmerising spectacle, especially because not only can you swap your own character’s dimension, at certain points you can swap everyone’s. It sounds confusing, and it often is, but when everyone is working in synergy it works surprisingly well. 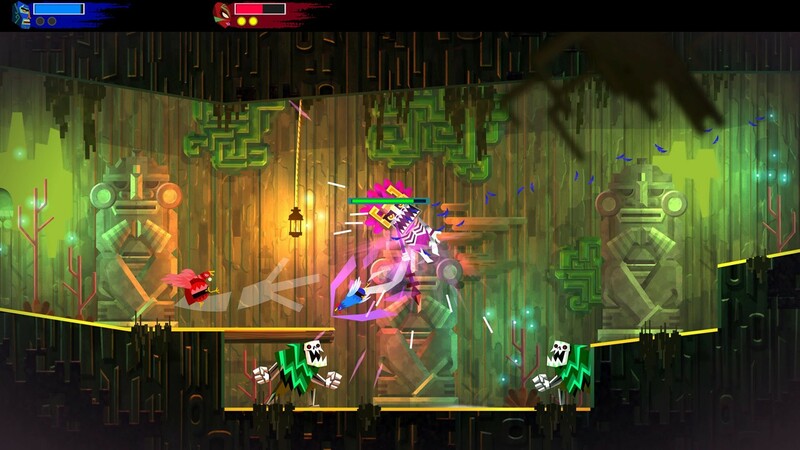 While the multiplayer is a fun way to switch things up, the meat of Guacamelee! 2 is the campaign mode, guiding Juan through each progressively harder challenge, steadily growing more powerful and unlocking more abilities. The incredible art style means that even when the difficulty is getting to you, you’re never tired of looking at the amazing backdrops. It’s ridiculously bright and beautiful at times, with each new area showcasing dazzling new palettes. The same can be said for the score, as mariachi bands and traditional Mexican music heap the atmosphere on as thickly as possible. Everything about Guacamelee! 2 oozes charm, from the slick, responsive gameplay to the art and music. The difficulty has a tendency to rocket up now and then, although overall it’s not a particularly difficult game. If anything, the jumping feels ever-so-slightly tighter this time around, and the huge array of moves and abilities, once mastered, make for some truly exhilarating platforming. Beautiful, bonkers, and brilliant. A colourful, enthralling adventure, Guacamelee! 2 is a superb sequel to a superb game.